My response is that I firmly believe that access to high quality art is a fundamental human right. That we need to listen to our students, we need to get to know them and learn what they want and need. We need to work with students and teachers and family members. And that we must always lead with love. And recently, my answer has started to include advocacy. If we want to create inclusive art, we must fight for inclusivity across the board. So often in the models of theatre that we have in the US, the arts and disability don’t intersect. In fact, I would argue that in many facets of our society, accessibility is rarely a part of the conversation. There are buildings on the Northwestern campus that don’t have a single accessible entrance. That’s just unacceptable. I had the incredible opportunity to study abroad in Ireland this past fall, and as part of my abroad experience I also had the chance to do some travelling across Europe. What I experienced abroad gave me hope in the future of accessibility within the states. I saw wheelchair users at the top of the Acropolis in Athens. I saw 3D models of paintings in art museums across Italy, giving visitors the chance to feel art they might not be able to see. I saw braille on every product sold in drug stores in Ireland. I saw programs across the European Union working to ensure that everyone has access to cultural opportunities, regardless of ability. In the UK and Ireland, inclusive arts practice is thriving. 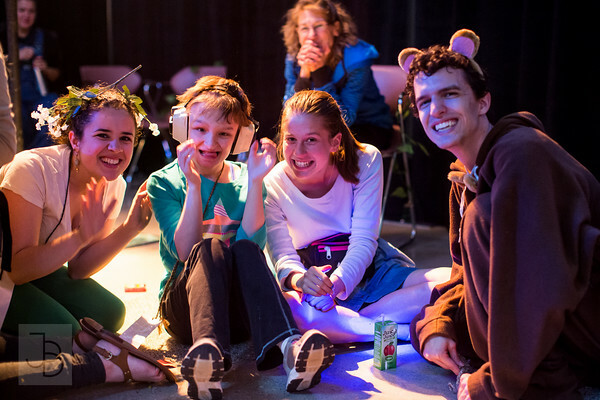 I saw the first-ever accessible show at the Edinburgh Fringe Festival, created by a group called Frozen Light specifically for young adults with developmental differences. I saw a show called Backstage in Biscuit Land, a humorous two-woman show advocating for equal access, performed by a group called Tourettes Hero. I worked with arts facilitators that teach workshops with young people with autism, create films and theatre productions with young adults with downs syndrome, and lead art therapy sessions for adults with dementia (check out one of these awesome groups called Run of the Mill Theatre here). Ireland in particular has an organization called Arts and Disability Ireland, a national non-profit geared towards making art with and for individuals with disabilities (check them out here, they’re rad and have awesome frameworks for accessible arts practice across all mediums!). As the Head Adventure Guide, my goal for this year is to deepen our commitment to inclusive theatre practice. I am excited to learn about other organizations abroad and in the states that fight for equal access in the arts. I am excited to have the ensemble help teach workshops in schools and strengthen skills in sign language and listen to our audience members’ wants and needs more than ever. I am excited to work with the board towards joining activist movements already in progress and creating networks of arts and advocacy groups across Northwestern and beyond.